LOS ANGELES (AP) — Los Angeles teachers returned to work Wednesday after contentious negotiations ended with a new contract and a commitment by the union and the district to work together to get more state money for schools in part by pushing to overhaul California’s property tax system. Teachers greeted students with smiles, hugs and high-fives after voting the night before to ratify the deal that includes a 6 percent pay hike for educators and a commitment by the district to reduce class sizes. The ratification vote period began Tuesday and will end Friday evening but most teachers already had cast ballots and 81 percent favored the contract, the union said. The tally was more than 20,000 “yes” votes to fewer than 5,000 “no” votes. The teachers’ return followed six days of picketing and a marathon bargaining session brokered by Mayor Eric Garcetti. Third-grade teacher Van Morales said it was a joy to go back to her students. “It’s missed time that we need to make up,” she said. 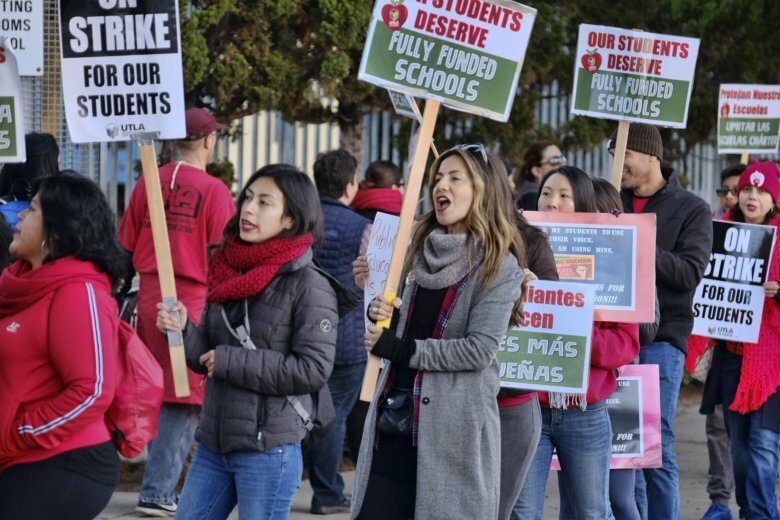 LA Unified School District Superintendent Austin Beutner said financial challenges remain despite the hard-fought deal with United Teachers Los Angeles. The district is projecting a half-billion-dollar deficit this budget year and has billions obligated for pension payments and health coverage for retired teachers. To that end, Beutner, union head Alex Caputo-Pearl and Garcetti agreed to “jointly advocate for increased county and state funding” for public education, according to a summary of the agreement released by UTLA. As part of that team effort, the mayor will endorse California’s Schools and Communities First ballot initiative and work with LAUSD and UTLA for its passage next year, the union statement said. Garcetti said he hopes to “build on the momentum we gained over the last week, and bring the same energy and spirit we saw in the streets” to push for education resources. The initiative, which has qualified for the 2020 ballot, would hike property taxes on California businesses and generate revenue for local and state governments that would filter to public education. It would change a key provision of Proposition 13, the landmark 1978 initiative that capped property taxes, slashing state revenue and saddling school districts with shrinking budgets. Supporters of the new initiative estimate that more than $11 billion per year would be restored for public schools, community colleges, health clinics and other vital services. Opponents say increasing property taxes on business would drive jobs out of state and make it more expensive to live in California. Kline suggested Beutner and Caputo-Pearl could find a sympathetic ear when they travel to Sacramento to ask Gov. Gavin Newsom for money. State government has controlled the allocation of money for schools since Prop. 13 was passed. The new governor’s budget proposal includes a $3 billion one-time payment to California’s teacher pension fund. Newsom said he wants to help districts that are seeing more of their budgets eaten up by pension obligations. Newsom also wants to invest $500 million in infrastructure to provide more childcare and $750 million for kindergarten programs. His predecessor, Gov. Jerry Brown, presided over an escalation of financing for schools. “Increases in state funding are already translating into real progress for kids and classrooms, including investments in community schools,” Newsom said in a statement Tuesday. Los Angeles teachers headed back to work a day after Denver teachers voted to go on strike after more than a year of negotiations. Colorado teachers have the right to strike, but state officials could delay the walkout by up to 180 days. In Oakland, California, some teachers called in sick last week as part of an unofficial rally over their contract negotiations, which hinge partly on a demand for smaller class sizes. Along with the pay raise and class-size reductions, the Los Angeles contract adds more than 600 nursing positions over the next three years. Teachers had complained that some schools only had a nurse on campus one day a week. Additional counselors and librarians are also part of the agreement. The new contract, which runs until June 2022, also eliminates a longstanding clause that gave the district authority over class sizes, officials said. Many schools will see a class-size reduction of about four students in three years — though 90 high-needs campuses will see six fewer students per class during that time. Associated Press writers Amanda Lee Myers and John Antczak contributed to this report.